The seas contain abundant treasures for humans. If you love the sea, you can’t fail to be captivated by the beauty of the sun reflecting off of its deep blues, or of the golden glow of a rich sunset. Even below the surface there is plenty to delight in, much of which ends up at your local market. You might even choose to go to a “big mart” for your seafood fix, but I suggest getting your hands wet, and a bit smelly, and catching it for yourself. While you’re at it you can enjoy the natural beauty of Jeju’s oceans. 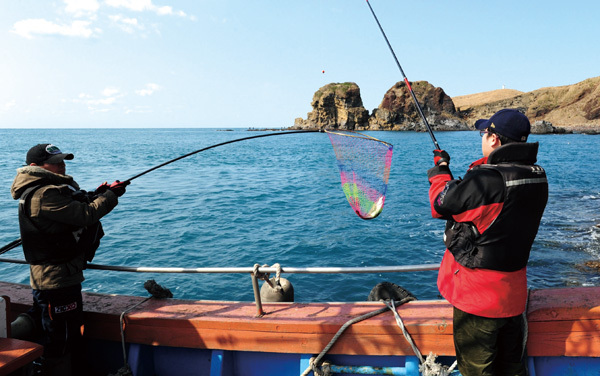 Fishing comes in many guises, from perching on Jeju’s black rocks on the coast, casting a line into the surf, to having a leisurely few hours at sea, bobbing up and down with the waves. For the former you just turn up with your rod, find a productive-looking crag — and claim it! (The best spots get taken pretty early, mind you.) The latter is just as easy, if you know where to go. The two main ways of fishing by boat are through renting an individual boat and skipper for you and your group, or by joining a larger commercial operation where you join strangers — although you quickly make friends. Looking back at the shrinking shore as you float out is a humbling experience, and it is easy to put your worries aside, even for just a few hours. That is not to say you should not be vigilant, as there are some vital things you need to know, not least of which is whether such a trip at sea is safe, or even legal. 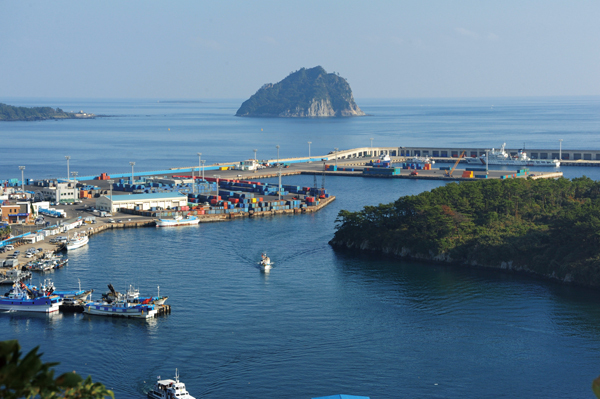 Both Jeju and Seogwipo municipal authorities control fishing boats operating in their respective waters with every boat in operation, big or small, having to be certified for safety on the open seas. As part of the registration process, officials must check facilities such as life jackets and evacuation procedures, for example. In the unfortunate event of injury, this insurance will cover hospitals bills — but only if your name is registered on the embarkation card. So, make sure this card is completed with your name, birthdate and contact number before getting aboard. Even if your boat checks out, you can’t guarantee against seasickness (“baemeolmi”) — and Jeju’s waves can be notorious, so pick up a tablet, liquids or even patches for behind the ears from your local pharmacy. If you are prone to seasickness it is recommended you take a bigger boat to minimize unsettling movement. Fishing in Jeju is really straightforward with many boats ready to take you out for autumn fishing. You can find a skipper and boat at most local harbors, and they will even provide you with fishing rods, hooks, and bait within the same basic fee. The best part about this experience is having a whole boat to yourself for the day. If the weather is cooperative, you can even do some sunbathing at sea with Jeju’s spectacular scenery laid out in front of you. Most skippers will also allow you to take your own drinks or snacks along, just ask first. If you are not in a group, or you prefer a larger boat, you can join fellow travelers on scheduled fishing trips. These normally leave from tourist hotspots and include a lot of passenger mingling, great if you are looking for a fishing buddy. 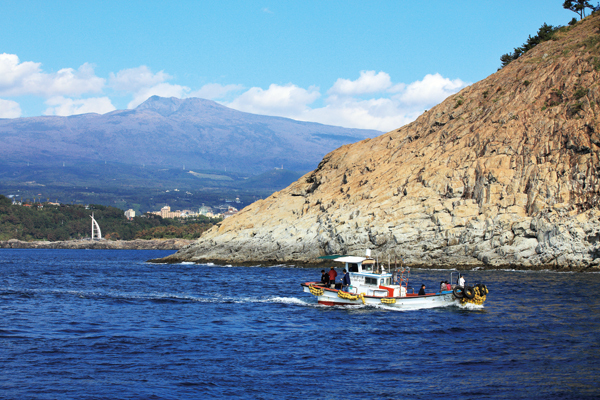 All in all, seafishing on Jeju is a truly unique experience, and it is extremely affordable. It also provides you with an unbeatable view of Jeju’s jaw-dropping coastline while enjoying the deep blue’s bounty. Without further ado, The Weekly has selected some of the most popular, just remember to book before you go! - All fishing equipment required is included in the standard price unless stated otherwise. - All prices include fish preparaton and spicy sauce unless stated otherwise. - Take your catch to a local restaurant for it to be made into a stew for around 6,000 won. - Trolling is where one or more fishing lines, baited with lures or bait fish, are drawn through the water by boat. - All times are subject to change so book in advance. The Iho Tewoo sands are easily reached by public transport and boast many seafood restaurants. They are also home to the mosalchi, Japanese whiting, which grows to up to 30 centimeters and enjoys the muddy, sandy habitat. Located right on the harbor, this is a convenient shop offering a variety of services. Day: 9 and 11 a.m., 1, 3 and 5 p.m.
Chagwido means “blocking the return” after Hu Zong Dan from Song dynasty China cut all water flow to Chagwido after a prediction that a great man would be born there. As he returned, a god of Mt. Hallasan, taking the form of a falcon, swooped onto his boat, before the wind tossed and sank it. The island is just 0.16 square kilometers but is the largest among a group of uninhabited islets located out to the west, just a short 10 minutes ride from Jagunae Harbor, Gosan-ri. Other jagged islets create stunning scenery and extremely rich fishing grounds. One of the bigggest in town, this 37-year-old family business provides day and night fishing with its fleet of 28 boats and runs four raw fish restaurants, “hoetjib” in Korean. Includes fishing facilities, bait, hot spicy sauce and raw fish preparation and fish barbecue (if you catch any). Pork, shrimp and squid also provided. 10 a.m., 12 p.m., 2 p.m. and 6 p.m. The beautiful backdrop of UNESCO-designated Seongsan ilchulbong and Geopark site Udo Island make this an ideal spot for boat fishing. With bigger, more comfortable ships, up to 72 people are catered for with other services including accomodation and tours. Day: 9 a.m., 10 a.m., 12 noon, 2 p.m. and 4 p.m. The southern coast is the closest you will get on Jeju to feeling on a tropical island. Regularly a degree or two warmer than the north, it enjoys longer summers and shorter winters, with balmy days even possible in December. The owner here has two boats in two locations so you can find what you are looking for. 10 a.m., 12 p.m., 2 p.m. and 4 p.m.